What a fantastic shot. You have a great knack for knowing which angle to approach a photo from. Love this one. Thank you for your visit and comment today! Lisa, it gives me a funny feeling while scrolling down. 🙂 Well done! Yikes, I hope it’s not vertigo, Janet. 😉 Glad you like it though! No, but just try starting at the top and scrolling down. Look at how the photo sort of moves. It’s kind of cool. The first thing I noticed was the organic form of the tree peeking through the girders. Then I noticed the geometric pattern the girders, shadows and bolts make a as you look down the wall. Love it! Thanks for letting me know how you read the photo, D’Arcy. You hit on the main points I like too and highlighted one of the reasons I chose the quote – looking through the angles (inside/outside) and becoming more open. Great take on, great shot! I love Seattle Public Library. 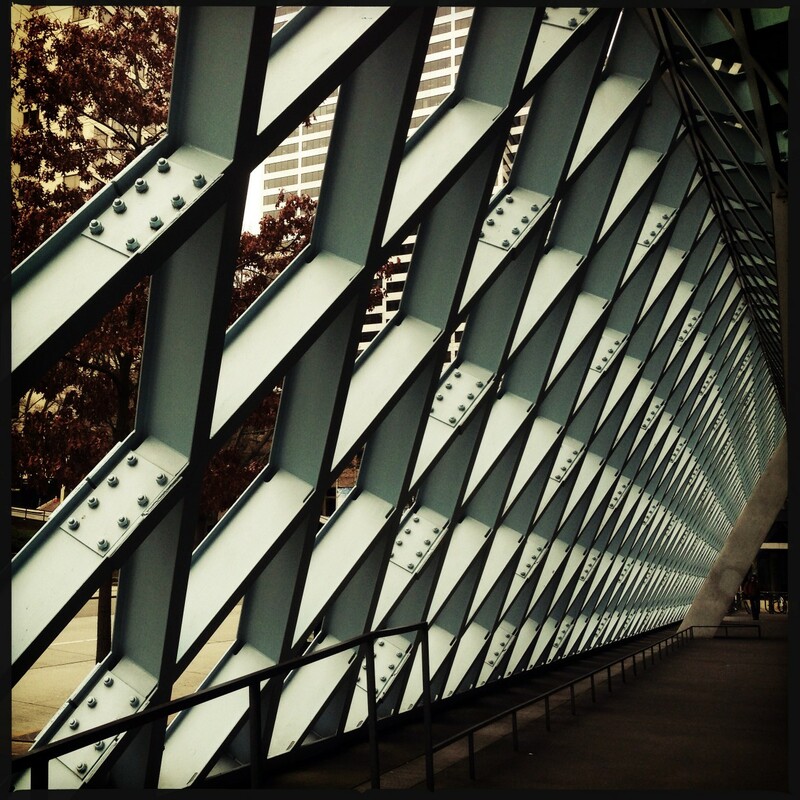 I like catching glimpses of Seattle in your photos, Lisa. We’re no longer heading that far north to visit our daughter. She moved down near Gig Harbor ❤ Now there are new sights to explore. Thanks, Jane I’m happy to provide your Seattle sights. 🙂 I’ve heard Gig Harbor is beautiful too! It is a very quaint place. I’m hoping to get to know it very well as time goes on. Impressive — not just the angles incorporated in the building’s design but also the angle at which you took this photo! Remarkable! Thanks for your nice comments, Rusha! You have a photographer’s eye, no doubt about it, Lisa ! – your shots never fail to bring enjoyment. Oh wow you’re welcome, M-R and thank you for such a wonderful compliment! This is so great Lisa. Just wondering how I am going to do this assignment and you just gave me an idea. Have a great Sunday. Great news, Bebs I’m happy I could provide some inspiration! Great angle on these angles! This photo is a real attention getter! Mesmerizing! Great photo for this theme. what a photo! my head immediately started spinning – so real! Such a beautiful composition…lovely shot! Thank you, Sid for both your comment and your visit today! Very nice shot. Nice composition, nice prespective.